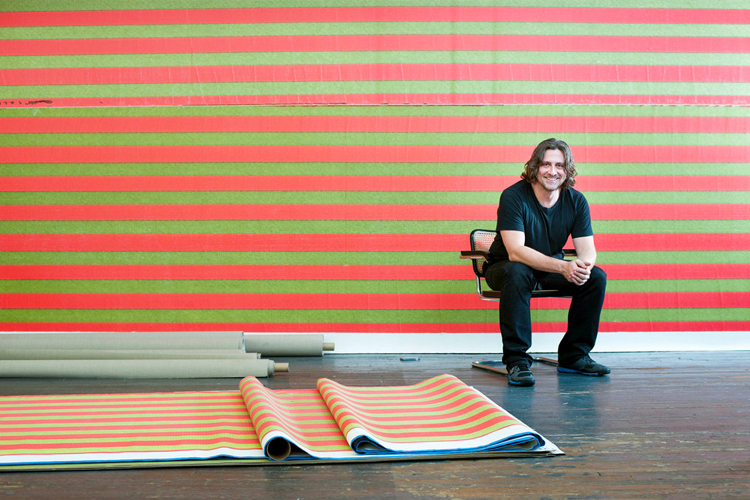 Million dollar American art that’s taking Italy by storm A-list American artists on show at the Venice Biennale (Bradford) and at the MADRE in Naples (Guyton). 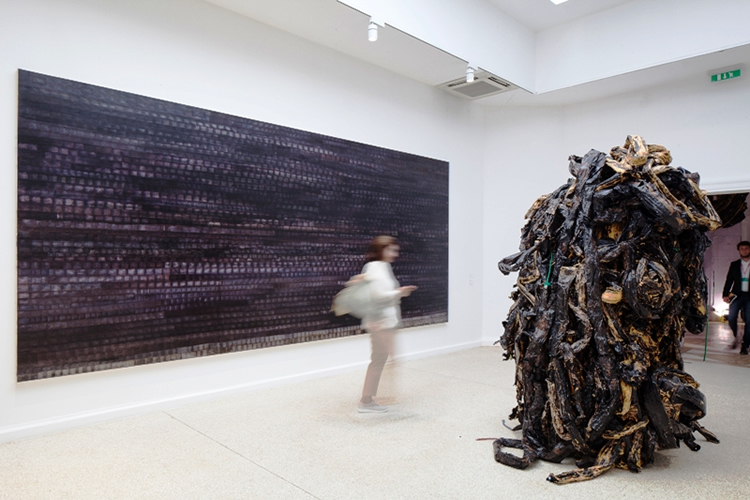 The Italian summer of contemporary art has consecrated two American artists, highly successful on the international scene, but also involved in the reality of our country. 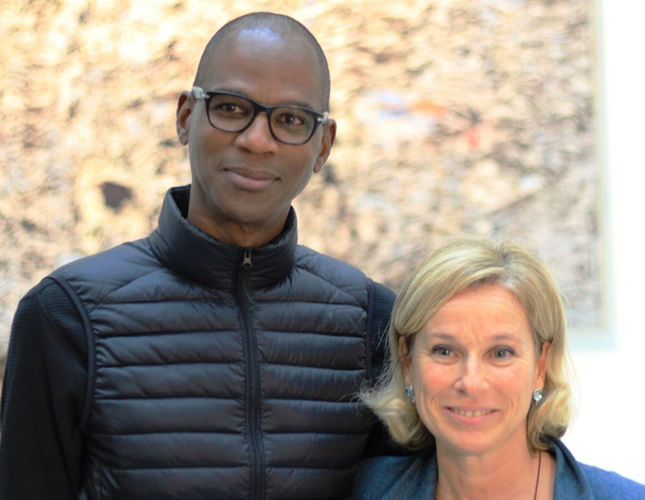 The first is Mark Bradford, who is officially representing the United States at the Venice Biennale (open until 26 November). An African-Californian born in 1961 in the poor neighborhoods of Los Angeles, Bradford grew up (he’s now two meters tall) with his hairdresser mother. Proudly gay, he now lives in New York and is currently quoted in the millions. Almost 3 million euros for the painting Biting the Book, auctioned in 2015; his earnings (only in auctions) were 18 million euros between 2000 and 2015. His art aims to evoke urban emotions and social conditions, with assertive colors filling material collages made from fragments, scraps and discards of posters and magazines. 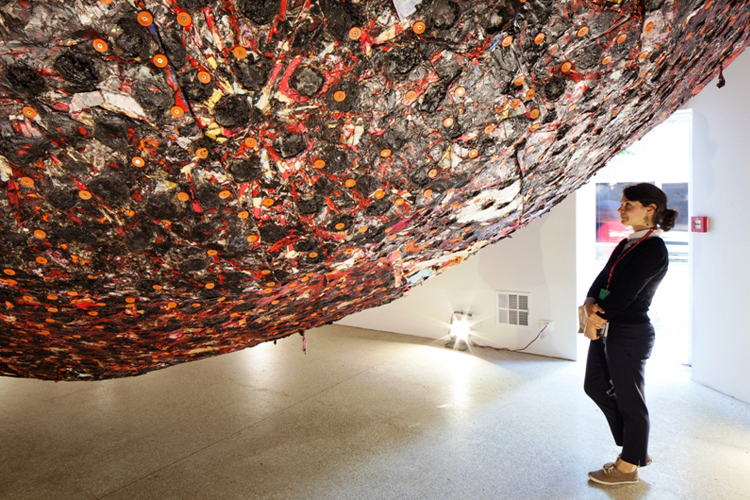 He conjures up the macrocosm and the microcosm, aerial views of cities and AIDS cells under the microscope, in a new expressionist “abstract” style. 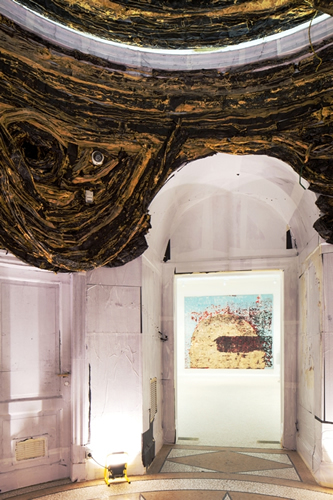 Now he has filled the American pavilion at the Gardens with dramatic informal installations of painting and sculpture. However, in keeping with his origins and his culture as a “liberal, progressive thinker” (his own definition), he has marked his presence in Italy with a social initiative. In Venice he has promoted and financed the opening of a small shop in Campo Santo Stefano run by a cooperative of ex-prisoners, “Rio Terà dei Pensieri”, who make bags and other accessories. He has also authorized a limited edition of a bag with an autographed picture of himself, “to make money” for them. The project “Process Collettivo” will be maintained for six years by the Foundation that he set up with his partner Allen Di Castro and the philanthropist Eileen Harris Norton. It is a commitment in favor of social outcasts for which he was received by Obama. 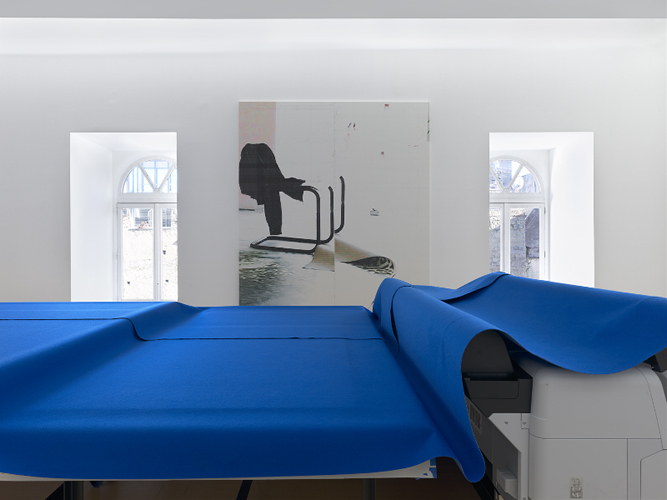 Now he says he has been caught unprepared by the rise of Trump, after feeling proud of representing his country in the pavilion in Venice – almost a “White House of art”. But he has taken up the challenge: “Tomorrow is another Day” is the title of the show, an allusion to the legendary Gone with the Wind. 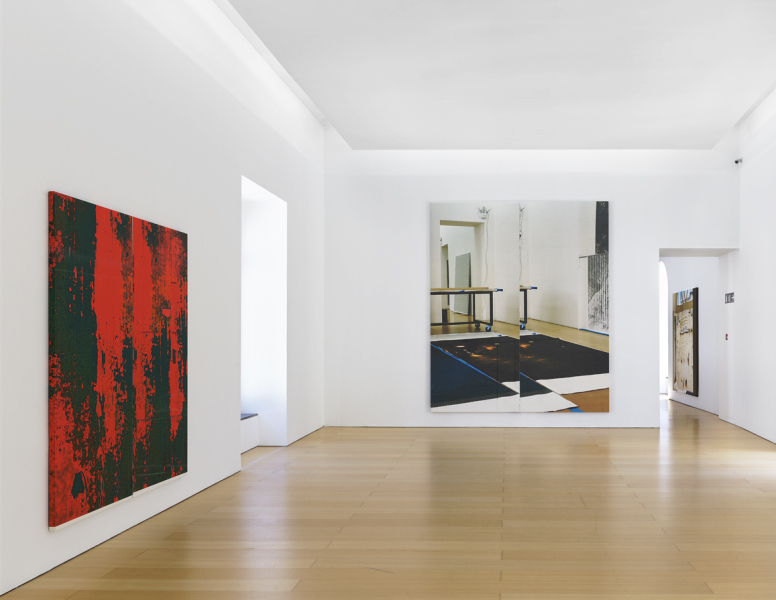 A different story, but with its own special interest, is that of Wade Guyton (Hammond, Indiana, 1972) who is holding a solo exhibition at the MADRE, the Museum of contemporary art in Naples, until 11 September (a date not chosen at random). Coming from the depths of the backwoods to New York, he quickly shot up the super-rich market and the list of world artists “to invest in”. He came to the forefront with “painting” that actually consists of digital images taken from computers, smartphones, scanners, and so on, and then processed using a similar technique to photoshop. Enlarged icons, ink-jet printed on canvas or other surfaces, include or even cause errors, defects and discrepancies in the montage. He started by enhancing enlargements of details – even single letters – until he achieved minimal art effects. 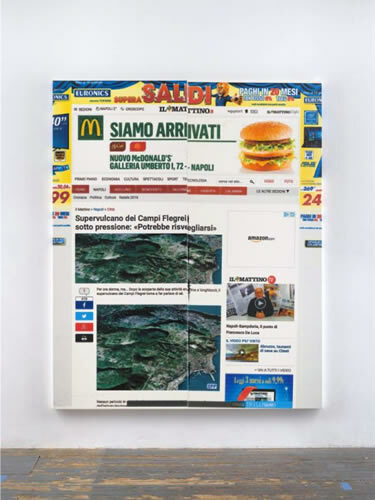 The abstract operation was mixed with the insertion of parts of newspapers or online news, so as to create a hybrid composition of iconic streams of news and advertising. 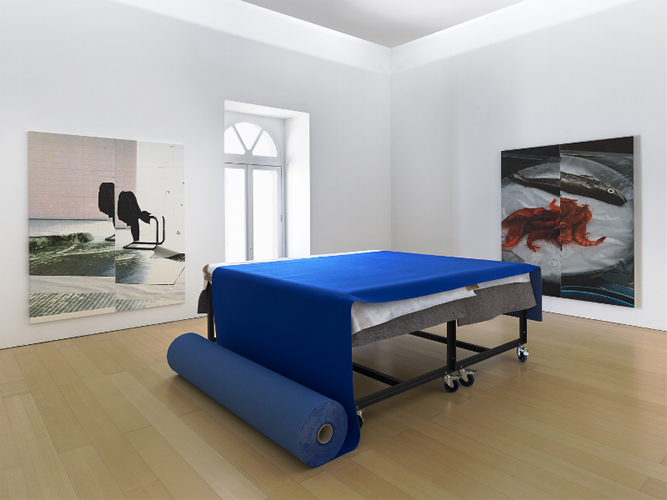 This follows in the wake of conceptual and pop art (“I want to paint like a machine” announced Warhol) and in Naples it is physically immersed in the real context. 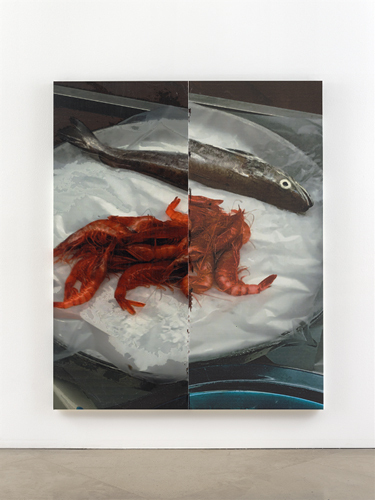 In fact Guyton brought his whole team to town to make his giant “pictures” on site: dipping into the home page of the on-line edition of the newspaper Il Mattino with local events or using random images of a plate of fish, a door, some chairs from a catalogue, a recognition code. The result is almost geometrical, almost metaphysical enlargements of details, marked with cuts or gaps between two parts of the print. These are made or simulated on site: the entire third floor of the Museum has been transformed into his workshop, with machinery, packing cases, printing rolls and plates in view. It is like locally sourced medial painting, a take-away of slices of life, stored in the fridge of icons of our time 2.0 . This is confirmed by the title of the exhibition, in Italian: “Siamo arrivati” (We’ve arrived), just like McDonald’s when their restaurants opened in Naples.